Credit Suisse Platinum Bars are available in the 5 gram size, slightly larger than the smallest weight available. These bars have the Liberty Design, and each is produced by Credit Suisse. Buyers can be assured that these bars are in new condition, and each is sold with an authentication that helps to ensure that your platinum is genuine. On top of that, Credit Suisse is one of the most well-respected and widely known names in the world when it comes to platinum bullion. 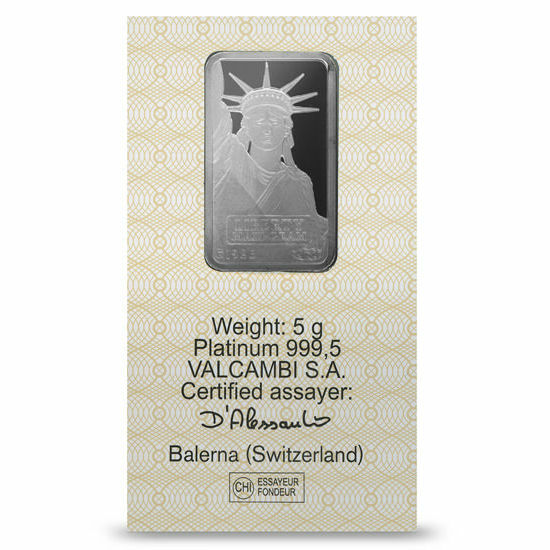 Upon looking at the 5 gram Credit Suisse Platinum bar, you will see the portrait of the Statue of Liberty. She is facing the viewer, and the details are outstanding. From the small windows in her crown to the small strands of hair surrounding her face, Lady Liberty has been etched with exceptional detail. Even the folds of her gown as she stands with her arm raised contain fine details. Though Lady Liberty takes up much of this side of the bar, there is a plaque in front of her with the phrase “LIBERTY MAXI-GRAM” contained within. In the lower left side is the date “1985” and on the right, the MTB logo. The opposite side of the bar has a frame with the words “CREDIT SUISSE” inside. Below that, you will see the words “5 g. PLATINUM 999.5.” There is also the words “Essayeur Fondeur” and the serial number of the bar is inscribed along the bottom. Each bar is shipped with flat-rate shipping and insured against loss, damage and theft. For more information about 5 gram Credit Suisse Platinum Bars, please contact us at your convenience. You can reach us via telephone at 1-888-989-7223, or through email and online chat.